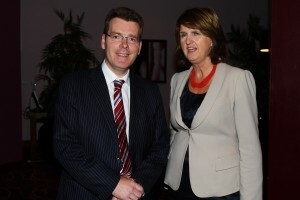 Pictured with the new Minister for Social Protection, Joan Burton TD, is Dr. Pat McCloughan of PMCA Economic Consulting. The occasion was an event in Bettystown, Co. Meath in September 2010 where Dr. McCloughan was invited to speak as an independent economist in respect of employment creation in east Meath and Louth. The event also featured an address by Ged Nash TD, who was also successfully elected in the recent General Election. 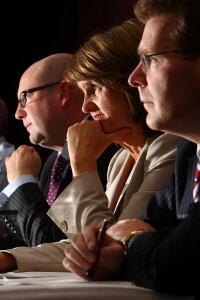 The second photograph below shows Ged, Joan and Dr. McCloughan listening to views from the floor at the event.